An artist's concept shows the ExoMars orbiter and lander approaching the Red Planet. The European-led ExoMars 2016 project is scheduled to drop a probe onto the surface of the Red Planet this Wednesday (Oct. 19), and you can follow the mission's biggest events online, including a spacecraft separation on Sunday (Oct. 16). ExoMars 2016 is a mission by the European Space Agency (ESA) and Russia that serves as a precursor to a Mars rover mission (with possible sample return) scheduled to launch in 2020. The current mission consists of the Trace Gas Orbiter (an orbiting satellite) and the Schiaparelli lander that will help test technologies for the future rover mission. The agency will broadcast live coverage of the lander's separation from the orbiting spacecraft on Sunday, starting at 10:30 a.m. EDT (1430 GMT). You can watch that webcast via ESA's livestream player. You can follow the mission live on Space.com here, courtesy of ESA. On Wednesday, the agency will webcast coverage of the lander touching down on Mars with a series of programs. An ESA Social TV webcast is scheduled to run from 9 a.m. to 11:15 a.m. EDT (1300 to 1515 GMT). 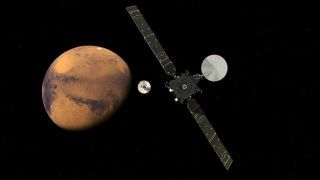 ESA's main ExoMars program will then follow in two parts: The first will begin at 11:44 a.m. EDT (15:44 GMT) and continue until about 1 p.m. EDT (1700 GMT). The second half of that broadcast will begin at 2:25 p.m. EDT (1825 GMT) and end at about 4 p.m. EDT (2000 GMT). You can watch that broadcast on ESA's live webcast page or on ESA's Facebook page. And finally on Thursday, the agency will webcast a press conference to deliver a mission status update, beginning at 4 a.m. EDT (0800 GMT). You can look for text updates on the ExoMars mission at ESA's mission homepage. You can also follow the Twitter accounts for ExoMars, and the ExoMars orbiter. Visit Space.com over the next week for complete ExoMars 2016 mission coverage leading up to the Wednesday arrival and landing.